It is the essential fatty acids in Rosehip oil that hydrates dry, sun damaged skin improves the appearance of burns, scars, wrinkles and stretch marks. 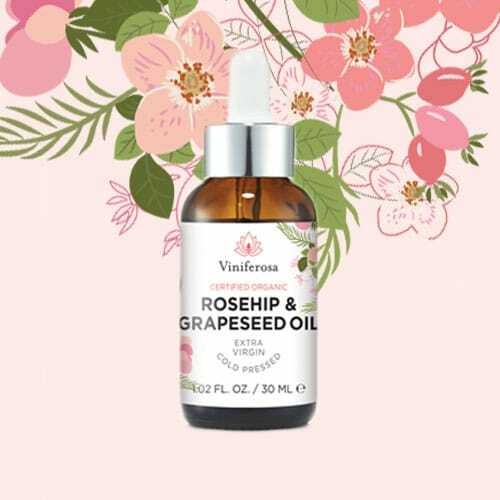 Grapeseed oil is known to treat acne, tighten skin, help diminish dark circles around the eyes, moisturise, reduce scars, restore collagen and fight ageing. Geranium oil minimises the look of wrinkles by tightening facial skin which reduces the effects of ageing. Lavender oil is used to treat various skin disorders such as acne, wrinkles, psoriasis, as well as a variety of inflammatory conditions. The nutrients of Rosemary can help protect skin cells from damage caused by the sun and free radicals.